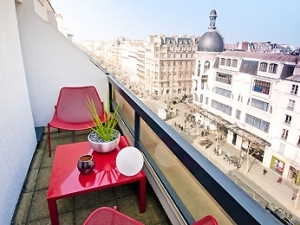 Just 150 meters from the Ternes Place distanced is the 4-star design hotel Mercure Paris located. From this adults-only hotel the distance to the Arc de Triomphe and the Champs Elysées are only a few minutes walks. All rooms are soundproofed and provide free Wifi access, minibar, coffee making facilities, satellite television as well as air conditioning. A highlight of the rooms is the chromotherapy lightening, for a relax and comfort stay in the centre of Paris. Each morning an big american breakfast buffet is served for having a great start into the day. Shall you be interested in some sightseeing, just ask at the reception desk, the friendly staff will help and also offers ticket service.